Drama takes a slight holiday this week and we get a more comedic turn with the Winchesters and their new hunting buddy Cas. The case they took on wasn’t the run-of-the-mill fare, but instead a whole new level of crazy. Why have normal deaths when you can have cartoon deaths? I’ve said it before, but I’ll say it again — Jensen Ackles does great comedy. 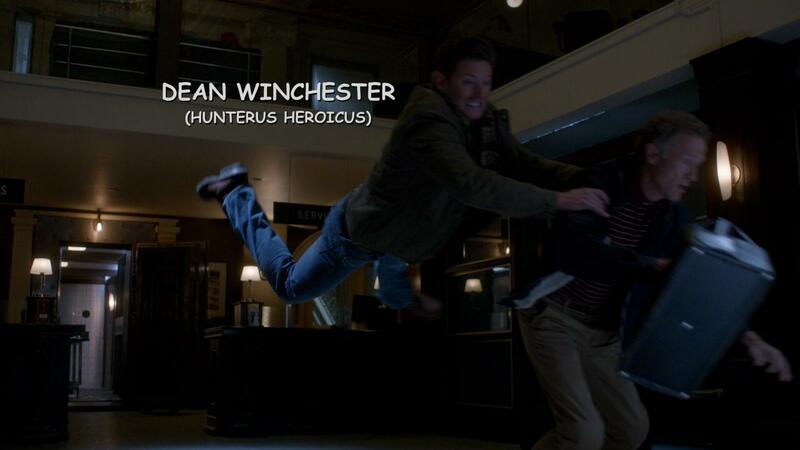 He’s got fantastic timing, wonderful facial expressions, and great ability to take falls. It’s a gift that I hope he gets to utilize in upcoming episodes as well as other projects. With a script like this one, though, it wasn’t hard to amp up the comedic acting. A heart beating out of your chest because of love, running out into thin air and hanging there until you realize where you are, an anvil falling on your head because you were unfortunate enough to stand on the giant X marking the spot, and the ability to blow away a cake because of a breath of air? It’s textbook Looney Tunes, and that’s a source of knowledge that Dean knows well. I really appreciated that they did the freeze frame of Dean and the villain, giving their scientific names in a call-out to the old Wile E. Coyote versus Road Runner cartoons. It’s always one of my favorite parts of Saturday mornings when that happens. The source of all this crazy was an old contact of John’s, a guy who the boys knew well. His name was Fred Jones, but for me the important part was who was playing him. That would be Mike Farrell, best known as BJ Hunnicutt from M*A*S*H. I am always appreciative when he appears on my television and to have him play someone who had previous connections to the boys made it extra special. Fred was a psychokinetic and now that he’s getting older, he’s losing his connection to reality. Instead of facing the struggles of the world around him, he’s existing inside a world he’s created among his favorite cartoons. The downside of this is that he’s still affecting reality, albeit unconsciously, so the boys have to figure out a way to bring him out of the situation without causing more harm. 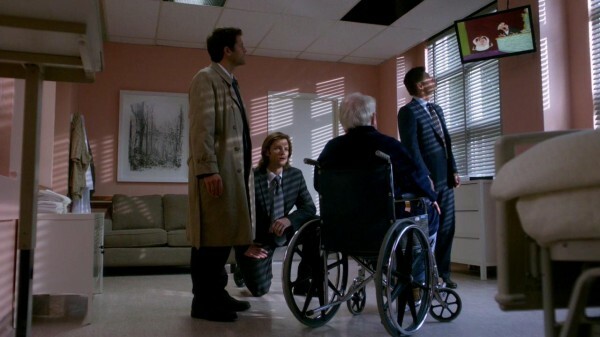 Sending Sam in and utilizing a speech that had relevancy to not only Fred, but also Sam and Cas themselves, made us pause to consider the implications to them all. There’s much more going on this season, with a constant struggle between perception versus reality, so we’re left to figure out which is which. 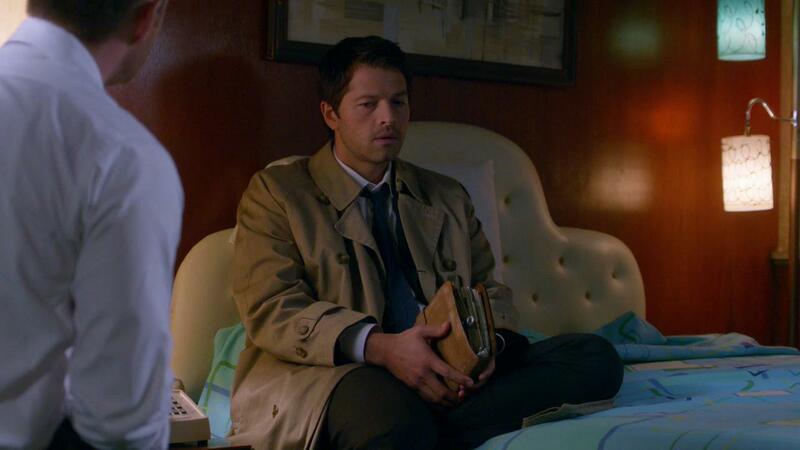 Castiel has had a lot to deal with since he returned from Purgatory. He knows how much pain he caused, not only on Earth, but in Heaven. I sympathize with his unwillingness to return to see what destruction he wrought upon his brothers and sisters up above. However, he wants to do the right thing and his first step is to get into the “saving people, hunting things” game that he’s watched the Winchesters go through all these years. But, watching from afar and actually going through the motions are two different things. Cas isn’t well-versed in being the bad cop in a “good cop / bad cop” situation, but at least he tried. And when he didn’t understand all the cartoon references, he put in some quality research time in front of the television, though I think he got deeper meaning from the eternal struggle of coyote versus roadrunner than normal viewers. And he took heart with Sam’s speech, so he was finally ready to return to Heaven. Too bad Naomi’s still pulling his strings and won’t allow that to happen. He’s going to stay on Earth and do her bidding until such time as his spying is revealed. I hope the boys won’t hold it against him when they find out he’s being played. And then we had Sam’s ongoing issues with his year off and whatever really happened there. As I mentioned before, there is a marked difference between perception and reality this season. I still maintain that what Sam’s remembering and what actually happened is going to end up being misaligned. There should be no question that he and Amelia were moving too fast when they bought a house together after knowing each other just a few months. These were two very broken people, suffering through massive loss of loved ones, and leaning on each other for support. The next logical step from that is not setting up domestic bliss in a new home with their dog. You could already see the cracks in his happy memories with the introduction of Amelia’s father, who distrusted Sam to the point of almost hatred. But just when that situation looked like it had been resolved, and that Amelia’s dad might actually be warming up to Sam’s presence in her life, Sam’s happy life got blown up. Don, Amelia’s supposed dead husband, is alive! What? How did that happen? And how is this going to negatively affect Amelia and Sam’s lives? Perhaps we’ll get some answers as to why Sam left Amelia in the middle of the night during the first episode. Sam said he had no connections to hunting, no outside person pulling him back into the fight, so maybe he chose to leave for Amelia’s sake. If he was no longer there, she wouldn’t be forced to choose between her old love and her new one. Whatever the reason, I’m very intrigued over how their stories are going to work out and how the season overall will work out. 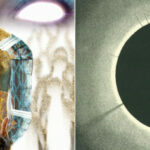 Many plotlines are leading to many potential avenues that they can take. 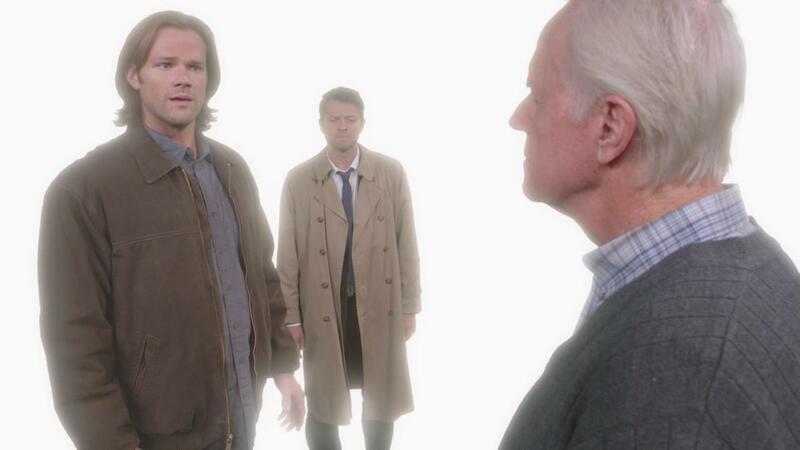 My review of SPN 8.08 is up on @Fandomania http://t.co/vdxW9l99 Love Mike Farrell & Looney Tunes call-outs. Jensen has great comedic timing.